1. Always have a pencil and paper with you, in every handbag, shopping bag, pocket, and of course beside your bed. You never know when that wonderful idea might strike. A Dictaphone might also be useful. Gone are the days when you got funny looks for talking into a machine or even talking to yourself walking down the road. Everybody’s at it now. So you can record yourself on whatever portable device you choose, but take care though, best to keep your spoken thoughts to safe points of the plots and characters. 2. Travel by public transport. If you’ve got a free bus pass so much the better, you can stay on it all day and save on heating bills at home. You see and meet some great characters for novels. You also hear some intriguing conversations which can be a fruitful source for crime stories, which brings me on to my next tip. 3. Listen into other people's conversations in cafes, bars, buses, trains. But don't be too obvious about it or you could end up being the victim of a crime yourself! 4. People watch. Register their body language, describe it, not in every detail but a gesture here, a twitch or mannerism there can add colour to your characters. 5. Write for yourself rather than trying to write something to suit your publisher, your agent, your readers, your best friend or the latest fad on social media. By the time you've finished writing, the fad will have evaporated into the ether and you’ll end up with something watered down and weak that nobody loves least of all you. 6. Don't read reviews, or if you do learn to take the rough with the smooth and then carry on writing for yourself and for enjoyment, not to please the woman from Woking who claims your novels are utter tripe. 7. Back everything up, again and again and again. 8. Take a break. You need time to 'think' your novel as well as 'write' it. Thinking time is never wasted, particularly if, like me, you enjoy knitting because then I also get a nice cardy as well as a crime novel. 9. If you get to the stage in your novel where you're bored with the story, then your reader will most certainly be bored too. Chuck it out and start again. Or as Raymond Chandler once said, bring in a man with a gun. 10. Marry someone rich. It helps when paying the bills. If you can’t then accept that writing is hard work. You don't get a pension plan, and you don't get a regular salary cheque. Nobody is forcing you to do this, so don't moan, enjoy it and if you don't enjoy it, don't do it. PS Don’t spend too much time drawing up lists otherwise you’ll never get any work done. Oh, and don't spend too much time on social media, yes I know it's fascinating what some people consider interesting and there are all those cute pictures of dogs, cats and kids, not to mention the alluring pictures of food and someone's glass of wine or cup of coffee, but before you know it two hours will have whizzed past and you've written not a single word. 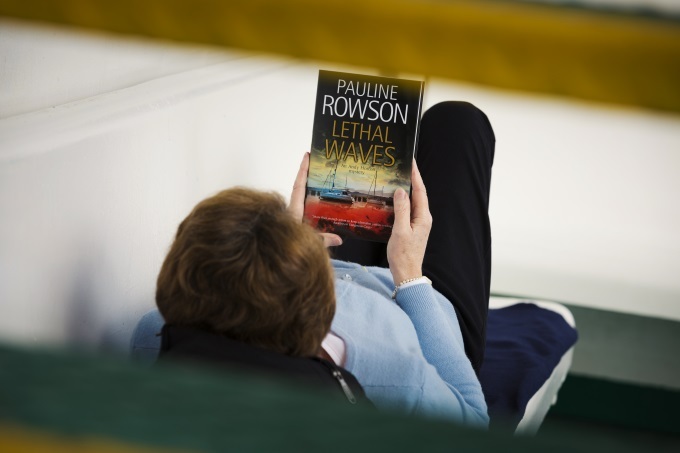 Subscribe to Pauline Rowson's newsletter.